La Selĝuka Imperio en sia plej ampleksa periodo, 1092. La Selĝuka Sultanlando Rum en 1190. La Selĝuka Imperio aŭ Granda Selĝuka Imperio (literumita ankaŭ Seljuk) estis mesepoka Tjurk-Persa sunaisma islama imperio, origininta el la tribo Kinik de Oguzoj. La Selĝuka Imperio kontrolis ampleksan areon etende el Hindukuŝo al orienta Anatolio kaj el Centra Azio al la Persa Golfo. El ties hejmlokoj ĉe la Arala Maro, la Selĝukoj antaŭeniris unue al Ĥorasano kaj poste al ĉeftero de Persio antaŭ finfine konkeri orientan Anatolion. La Selĝuka Imperio estis fondita de Tughril Beg (1016–63) en 1037. Tughril estis starigita fare de sia avo, Selĝuk-Beg, kiu estis en tre alta rango en Oguzio. Selĝuk havigis sian nomon kaj al la Selĝuka Imperio kaj al la Selĝuka dinastio. La Selĝukoj unuigis la frakciigitan politikan scenejon de la orienta Islama mondo kaj ludis ŝlosilan rolon en la Unua kaj Dua krucmilitoj. Tre persiigta en kulturo kaj lingvo, la Selĝukoj ludis ankaŭ gravan rolon en la disvolvigo de la turk-persa tradicio, eĉ eksportante persan kulturon al Anatolio. La setlado de Tjurkaj triboj en la nordokcidentaj periferiaj partoj de la imperio, pro la strategiaj militaj celoj eviti invadojn el najbaraj ŝtatoj, kondukis al la iompostioma turkigon de tiuj areoj. Stokes, Jamie, eld. (2008). Encyclopedia of the Peoples of Africa and the Middle East. New York: Facts On File. ISBN 9780816071586. (2002) “Review: The History of the Seljuq Turkmens: The History of the Seljuq Turkmens”, Journal of Islamic Studies 13 (1), p. 75–76. doi:10.1093/jis/13.1.75. Bosworth, C. E. (2001). Notes on Some Turkish Names in Abu 'l-Fadl Bayhaqi's Tarikh-i Mas'udi. Oriens, Vol. 36, 2001 (2001), pp. 299–313. Dani, A. H., Masson, V. M. (Eld), Asimova, M. S. (Eld), Litvinsky, B. A. (Eld), Boaworth, C. E. (Eld). (1999). History of Civilizations of Central Asia. Motilal Banarsidass Publishers (Pvt. Ltd). Asimov, M. S., Bosworth, C. E. (eld.). (1998). History of Civilizations of Central Asia, Vol. IV: The Age of Achievement: AD 750 to the End of the Fifteenth Century, Part One: The Historical, Social and Economic Setting. Multiple History Series. Paris: UNESCO Publishing. Jonathan Dewald, "Europe 1450 to 1789: Encyclopedia of the Early Modern World", Charles Scribner's Sons, 2004, p. 24: "Turcoman armies coming from the East had driven the Byzantines out of much of Asia Minor and established the Persianized sultanate of the Seljuks." C.E. Bosworth, "Turkmen Expansion towards the west" in UNESCO History of Humanity, Volume IV, titled "From the Seventh to the Sixteenth Century", UNESCO Publishing / Routledge, p. 391. Mehmed Fuad Köprülü, "Early Mystics in Turkish Literature", Tradukita de Gary Leiser kaj Robert Dankoff, Routledge, 2006, pg 149. Stephen P. Blake, Shahjahanabad: The Sovereign City in Mughal India, 1639–1739. Cambridge University Press, 1991. pg 123: "For the Seljuks and Il-Khanids in Iran it was the rulers rather than the conquered who were "Persianized and Islamicized"
Encyclopaedia Britannica, "Seljuq", reta eldono: "... Because the Turkish Seljuqs had no Islamic tradition or strong literary heritage of their own, they adopted the cultural language of their Persian instructors in Islam. Literary Persian thus spread to the whole of Iran, and the Arabic language disappeared in that country except in works of religious scholarship ..."
F. Daftary, "Sectarian and National Movements in Iran, Khorasan, and Trasoxania during Umayyad and Early Abbasid Times", in History of Civilizations of Central Asia, Vol 4, pt. 1; eldonita de M.S. Asimov kaj C.E. Bosworth; UNESCO Publishing, Institute of Ismaili Studies: "... Not only did the inhabitants of Khurasan not succumb to the language of the nomadic invaders, but they imposed their own tongue on them. The region could even assimilate the Turkic Ghaznavids and Seljuks (eleventh and twelfth centuries), the Timurids (fourteenth–fifteenth centuries), and the Qajars (nineteenth–twentieth centuries) ..."
↑ "The Turko-Persian tradition features Persian culture patronized by Turkic rulers." Vidu Daniel Pipes: "The Event of Our Era: Former Soviet Muslim Republics Change the Middle East" en Michael Mandelbaum, "Central Asia and the World: Kazakhstan, Uzbekistan, Tajikistan, Kyrgyzstan, Turkemenistan and the World", Council on Foreign Relations, p. 79. ↑ Grousset, Rene, The Empire of the Steppes, (Rutgers University Press, 1991), 574. ↑ Bingham, Woodbridge, Hilary Conroy and Frank William Iklé, History of Asia, Vol.1, (Allyn kaj Bacon, 1964), 98. An Introduction to the History of the Turkic Peoples (Peter B. Golden. Otto Harrasowitz, 1992). p. 386. John Perry. "The Historical Role of Turkish in Relation to Persian of Iran". Iran & the Caucasus, Vol. 5, (2001), pp. 193–200. 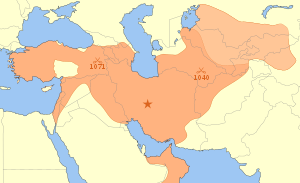 "Iranian influence on Caucasian languages. There is general agreement that Iranian languages predominated in Azerbaijan from the 1st millennium b.c. until the advent of the Turks in a.d. the 11th century (see Menges, pp. 41–42; Camb. Hist. Iran IV, pp. 226–28, and VI, pp. 950–52). The process of Turkicization was essentially complete by the beginning of the 16th century, and today Iranian languages are spoken in only a few scattered settlements in the area." Ĉi tiu paĝo estis lastafoje redaktita je 19:33, 23 dec. 2017.